We need you! From dogs and cats, to laundry and landscaping – we offer a variety of opportunities at Butte Humane Society which help keep everything running smoothly. Our shelter runs 365 days of the year and we always need help keeping it up! When you donate your time to Butte Humane Society you are helping to provide the extra love and support our animals need to prepare for their forever homes. At the end of the day, you’ll know that your time had an impact on BHS animals, and we’re sure they’ll have an impact on you! Step 2: Purchase your volunteer shirt ($15), and participate in the online orientation. Step 4: Volunteer and HAVE FUN! We request a 6 hour commitment a month to remain an “active” volunteer. This is because procedures may change, and we want our volunteers as informed as possible to ensure everyone’s safety. ** Holiday hours are limited. For the safety of our “two legged little friends,” and due to liability reasons we require all volunteers to be 12 years or older. Volunteers who are 12-15 years old (aka Junior Volunteers), we welcome your help. 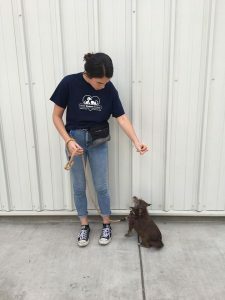 We have a lot of specific tasks that are perfect for young people to help out with such as socializing cats, grooming the pets, animal enrichment projects, folding laundry, and more. When filling out the volunteer application under the dropdown “Type” select the “Junior” option. For liability reasons, an adult must be present at all times the 12-15 year old is on site. That adult must also apply to be a volunteer and go through the orientation process with the junior volunteer. Volunteers who are 16-17 years old may volunteer without an adult on site, but they must have a signature from a parent/guardian on the release form found in the online application. 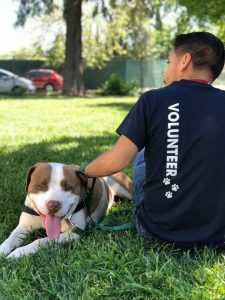 If you have an idea for a group volunteer activity or a special request, please email our Volunteer Coordinator at volunteer@buttehumane.org. Please include an ideal date, time, and general area of work you would like to help out in. Ready for the next step? We have special programs for our volunteers depending on experience levels. **Volunteers must be 18 years or older to participate in off-site programs. D.O.G. – Dog on the Go. Volunteers take a dog for a day away from the shelter. 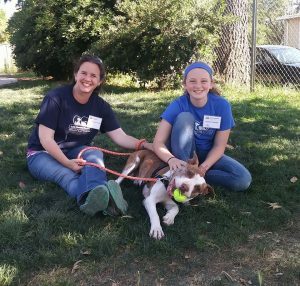 These volunteers must have at least 20 hours of experience with our dogs. Bedtime Foster – An extension of D.O.G., volunteers take a dog home for the night for some quality time and love. Level 2 & 3 Dogs – Volunteers that have 30 hours of experience with level 1 dogs may request to partake in level 2 dog training. After 30 hours of experience with level 2 dogs, volunteers may request level 3 dog training. Play Groups & Tandem Walks – Volunteers may request Play Group training and partake in Tandem Walks if they have completed 30 hours of experience or more. Mentor – Mentors are trusted volunteers that embody the image and mission of BHS. Interested volunteers must have 30 hours or more within a 4 month period in the area they would like to be a mentor and be nominated by a staff member. I have volunteered with BHS in the past, do I still need to go through the Volunteer Process? Yes. If it has been more than six months since you last volunteered, you will need to come back through the orientation, as oftentimes policies and procedures have changed. I have volunteered with another rescue organization; do I still need to go through the BHS Volunteer sign-up process? Yes. Every rescue is different with different protocols and procedures and it is imperative that all of our volunteers know how Butte Humane Society handles our animals for their safety and yours. Plus it’s fun – you will get to know other like-minded volunteers just like yourself. Can I volunteer to satisfy required community service hours? At this time we do not offer volunteer opportunities to fulfill court-ordered community service hours. Please check with the staff at City of Chico Animal Services for opportunities to do so through their organization. Wish List – Butte Humane Society is always in need of supplies! You can start your own wish list drive for BHS with your school, friends, or community. ** Please find our wish list here. Become a Fan – Like and follow our Facebook page and Instagram, then invite your family and friends to do it too. Like and share adoptable pet posts so they’re seen by as many potential adopters as possible. Donate your Birthday – Request donations for Butte Humane Society instead of presents. Refer to our wish list for gift ideas! Spread the Word – Educate your friends and family about the importance of spaying and neutering your pets to prevent overpopulation. Contact our Volunteer Coordinator at volunteer@buttehumane.org.